Edinburgh is one of the finest historic cities in Europe for exploring on foot and its proximity to spectacular mountains, lochs and coastline make it truly unique. The 40 easy walks in Edinburgh and the Lothians capture all that is best about Scotland's capital – the atmospheric Old Town with its intricate closes and sinister past; the New Town with its elegant crescents and gardens; volcanic Arthur's Seat above Holyrood Palace and the Scottish Parliament; and the Water of Leith, which takes you through the villages at the heart of the city. 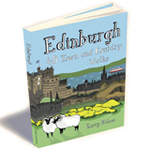 This book includes tours of the capital's galleries, museums and literary heritage, its hills, its country parks and its coastline, accompanying the walker out to the nature reserve at Aberlady Bay, the seaside town of North Berwick with its offshore seabird colony, historic Linlithgow loch and palace, Edinburgh’s famous Pentland skyline and much more.